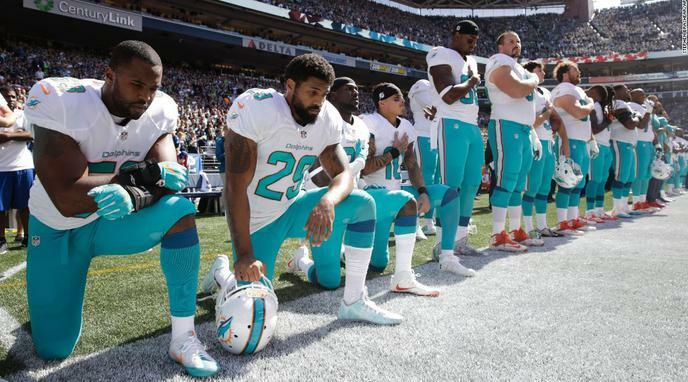 Forcing NFL players to stand is not okay in the context of American and Football values. The players may feel that the system of values associated with the national anthem are not being represented by groups in society. They could be drawing attention to this rather than disrespecting or disregarding the values themselves. It is the most American thing of all to stand up against a government that you believe is oppressive or mistreating its citizens. That is what this country was founded on. If an athlete wants to use the notoriety gained by playing a game to shed light on the plight of fellow citizens being mistreated by their government, that is noble and worthy of our careful consideration. Those who try to twist these actions into being anti-American certainly don't understand what America is. If your society's fundamental values are democratic engagement and free speech, then during the national anthem is an ideal time to exercise both and draw attention to injustice. The American flag represents American values. These values include equal opportunity and treatment regardless of race or gender. If players stand for the flag, they are pushing these ideals forward. American values include the liberty of a business to discipline or dismiss employees who conduct themselves in any way the business dislikes. This is particularly true in the NFL, where the contracts include agreements about conduct and public image.